WE MAKE THE CITY RUN! ARE WE FED UP YET? There is not one unionized city worker working with a contract right now. Over 300,000 workers in 152 bargaining units have been working without contracts for four, even five years. Now city leaders threaten us with more years of wage freezes and loss of benefits. Yet we do it all. City workers keep the city clean, we keep it safe, we care for the city’s health, we transport people, we educate its children. WE ARE THE WORKERS WHO MAKE THE CITY RUN! City leaders and the media have been conducting an organized attack on unionized labor, saying we cost too much money. That’s because they want to lower the standard of living for ALL workers. They target and scapegoat unionized workers because they know that where large groups of workers’ organize, all workers benefit. They want us workers to pay for their unending economic crisis. A key ingredient in any fight back is workers’ unity. We need to unite across unions and our fight needs to be anti-­‐racist and anti-­‐sexist. That means uniting Black, Latin@, Asian & White, and female & male workers. By targeting mostly Black & Latin@ unionized bus drivers last winter, for example, the city bosses attempted to establish a pattern to drive down wages and benefits for all and put us all on the defensive. Racism & sexism work as a wedge to attack all workers and we can’t allow that! AN INJURY TO ONE IS AN INJURY TO ALL. We in organized labor determine what happens with other workers, both here in NYC and nationwide. If we fight back, ALL WORKERS GAIN. 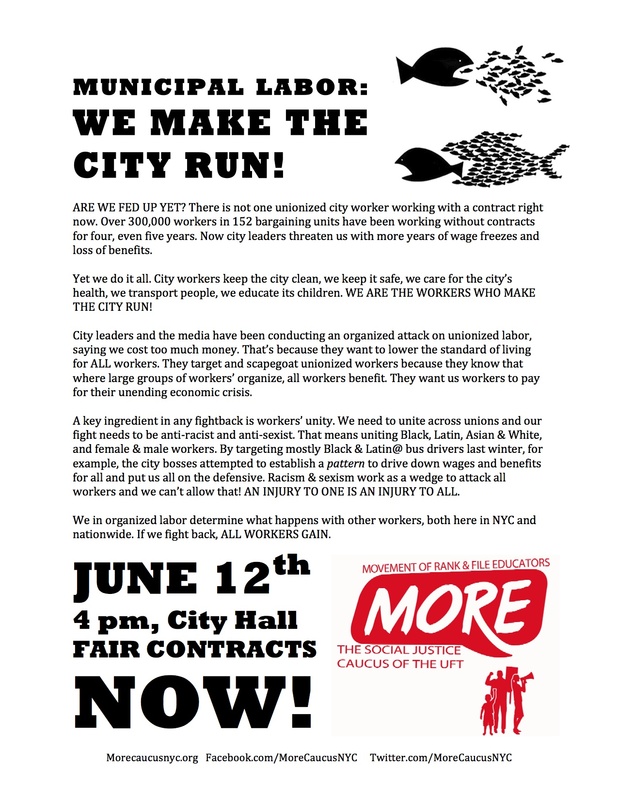 4 pm, City Hall FAIR CONTRACTS NOW! This refusal by city governments to sign a contract with Unions is part of an all out attack against the working class across the USA, LA, Chicago St. Louis, and other cities. We, rank and file workers must see that what is taking place is a careful premeditated plan directed against Unions in general, by the corporations, in order to break them. Our strategy has to, be a united front movement across the country, Wisconsin was the beginning, right now the attack has been intensified in North Carolina. We have no choice, after June 12, lets organize a contingency to go to North Carolina and join the civil disobedience Moral Mondays, bill of rights, movement there. an injury to one is an injury to all.